Rome is a masterpiece packed with wonders, ranging from some of the world’s finest art to the most exquisite cappuchino. The writer, an eternal fan, has just been back to top up his list of things to do in one of his favourite places. For me one of the joys of visiting Rome is finding our favourite restaurants from way back haven’t changed at all. Monte Carlo, on Vicolo Savell, may be displaying a few more photos of Carlo posing with famous customers, but his prices are still stuck deep in the past. How about two pizzas and a half litre of smooth, young house red for a ridiculous €25? www.lamontecarlo.it. At Trattoriia da Giggetto (Via del Portico d’Ottavia) they make the fried artichokes and the Filetti di Baccala (cod fritters) just as the Ceccarellis devised it in 1923. You’re unlikely to be disappointed in any small family place in Rome. My cafe choices are Tazza d’Oro, by the Pantheon, and Cafe Pace (Via della Pace) where they serve TV detective Aurelio Zen his favourite grappa. I vouch for its restorative effect. If a stray meteorite ever took out Rome they’d be able to rebuild it, from the big monuments down to the most intimate viale, just by looking again at the many films shot there. 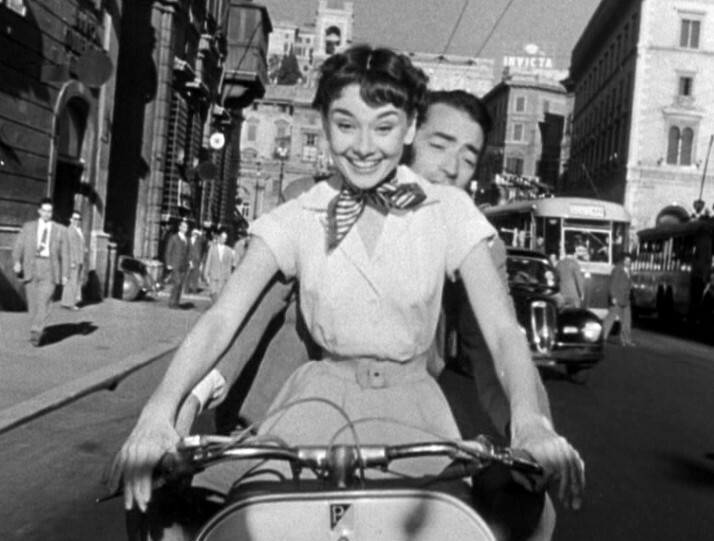 Think Bicycle Thieves through to the BBC’s Zen series, via Federico Fellini’s La Dolce Vita and many other homages to Rome. 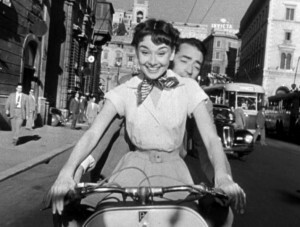 The one they would study most closely is Roman Holiday – on our visit the image of Gregory Peck and Audrey Hepburn on a scooter was everywhere. Look up this walk, on www.gpsmycity.com. It links up many locations in the film, and takes you down some fashionable streets. Most elegant of all is Via Margutta, full of high-end galleries, where Joe Bradley (Peck’s character) and the real Fellini lived. One of the most poignant places in Rome has nothing to do with the imperial grandeur, or centuries of great art and architecture which is so abundant here. It’s where a doomed 25 year old lived his last six months. Standing in the room where John Keats died of TB in 1821 was intensely moving, while everyday life continued just outside on the Spanish Steps. Externally Keats-Shelley House is unchanged from when Keats moved here in vain hopes of a recovery, with so much more to say as a poet. But his reputation as a great muse was already already assured (see the movie Bright Star). Everything in this small museum is in English, and there’s an excellent shop. The Landmark Trust rents out the apartment above. From our room on the eighth floor of the five-star Rome Cavalieri, on a tranquil hilltop retreat just west of the Tiber, we could see the glory of Rome spread out below us. After planning out the day ahead in this luxury bolt hole, we sallied forth into the city on the free shuttle bus that runs every hour. Back in the evening for a tough choice in this Waldorf Astoria hotel: luxury pampering in the spa? Refreshing dip in the choice of pools? Or a stroll in the lush hotel gardens. We tried all three during out stay. Then dinner in the excellent L’Uliveto restaurant. On thing marks the Cavalieri out from many other top hotels. It’s the fine art collection, (together with original Rudolf Nureyev costumes). And I would add to my “definitions of civilisation” list the afternoon tea in the lobby, under Tiepolo’s Ulysses discovering Achilles among the Daughters of Lycomedes. Take Madeline Miller’s Orange Prize 2012 winner, The Song Of Achilles, for the reference. There was just time for a hectic dash to the last church on our list, Santa Maria della Vittoria. We had only five minutes there before we had to leave for the airport, but what a glorious memory. I’ll never forget that brief glimpse of a minor marvel of Renaissance Italy. The Ecstasy of Saint Teresa, Bernini’s serene and passionate sculpture in white marble, is one of many masterpieces scattered liberally among the city centre churches. Also on my list is Santa Maria del Popolo, for the Conversion of St. Paul (the apostle is flat on his back, arms outstretched) painted by the hotheaded genius Caravaggio. His powerful works, startlingly lit against dark shadow, were the movie posters of the 1600s. His St Matthew Trilogy is in San Luigi dei Francesi, close to the Pantheon. Citalia, www.citalia.com, leading Italian specialists, arranged Gareth’s trip. He stayed the night before flying in the Gatwick Hilton, through HolidayExtras.com, for packages at all major UK airports, with parking. Previous PostSo wise, so young – Gareth Jones, Journalist. Next PostMcDonald’s Filet-o-Fish: could it win an Olympic gold for sustainablity?